Welcome to the Northern Forest Canoe Trail. The NFCT is a living reminder of when rivers were both highways and routes of communications. The Trail is 740 miles of historic waterway traveled by Native Americans. Its west to east direction begins in Old Forge, New York, and travels through Vermont, Quebec, New Hampshire and ends in Fort Kent Maine. The non-profit that established the Trail divides the trail into 13 sections and offers detailed maps for each of these sections. 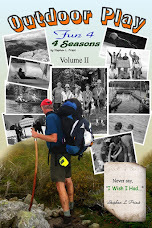 Our journey was Section 2 in the Adirondack and Saranac region of northern New York. We began at the Long Lake bridge paddling in a north-east direction and ended 42 miles and 3 ½ days later at the Village of Saranac. We hired Adirondack Lakes & Trails Outfitters to drive us to the put-in so we could leave both our vehicles at the Flower Lake take-out – thus saving ourselves 2 plus hours being homeward bound. Our trip included transfers through two hand-operated locks to convey paddlers between waterways, and three very demanding portages totaling 11.5 plus miles. Day 1: A 15 plus mile paddle on Long Lake, then a 1.6 mile portage around Raquette falls – which took three trips for 4.8 miles - with our day ending at the Palmer Brook lean-to on the Raquette River. Day 2: Raquette River to Stony Creek Ponds, a 1.1 mile Indian Carry portage - which took five trips for 5.5 miles - and the .4 mile Bartlett Carry into Middle Saranac Lake to our campsite on Norway Island. Twelve miles paddling day. Day 3: We paddled through the Upper Locks into Lower Saranac Lake to our campsite on Partridge Island. About an 8 mile paddling day. This Section 2 water highway has no fresh drinking water sources. Dehydration can be a major issue. We restocked our drinking water at night boiling lake water with our Jet Boil. In addition, it rained our second night, and we directed rainwater from our camp tarp to our cooking pans hence to our water bottles – thus saving Jet Boil fuel. More specifics of our Section 2 paddle, portages, and locks can be found in a day-by-day 50 minute web link video at Bedford Community TV. If you want to read more details of our four days paddling the Northern Forest Canoe Trail Section 2 read on. Gary, a Park Ranger, visited our camp and emphasized issues of dehydration, particularly on the two upcoming portages at Indian Carry (1.1 miles) and Bartlett carry (.4 miles). He advised us on maps of Section 2, and reminded us to be sure our campfire was completely out before we left camp. Given our first day was a very demanding 1.6 mile portage that we had to do three times for 4.8 miles (carry canoe, return to take-out, carry backpacks),we decided at Indian Carry the four us would carry one canoe. This proved to be really exhausting, as we did five trips over the 1.1 Indian Carry trail (carry the 65 lb old town, walk back, carry the 72 lb Grumman canoe, walk back, and carry the backpacks). These five trips totaled 5.5 miles. We were exhausted by the time all canoes and gear with on the Upper Saranac Lake put-in. And we continually reminded ourselves to drink our water before we became dehydrated. Brian, you are an angel!! He saved us at least an hour of portaging – and certainly provided the physical relief we needed. I gave Brian my OutdoorSteve business card, and told him to send me an email so I could mail him a signed copy of Outdoor Play: Fun 4 4 Seasons. We paddled on the Upper Saranac for an hour and came to Bartlett’s Carry.We were now sharing our two bottles of remaining fresh water – like in rationing. And we had the Bartlett .4 mile carry left for at least 1.2 miles, AND if we had four people for each canoe, we had nearly two miles left! After our grueling human transport of 5.5 miles at Indian Carry (due to four of us per canoe), our exhaustion told us to return to two people per canoe to eliminate an extra one mile portage. We finished Bartlett Carry still alive and entered Middle Saranac Lake. It was about an hour’s paddle to Norway Island, our campsite for the night. Amen!! Our Norway Island campsite (#74) was perfect. It was the only campsite on the island and had pine trees growing amongst the rocks. The ranger at Palmer Brook told us about a coming storm that evening, so we immediately put up our tents, and then a tarp over the campsite table. Indeed that evening we had a terrible rain storm with lightning and wind. Once the camp was set up Dundee took a cool clear water Middle Saranac Lake swim. The rest of us were too exhausted. I dreamed about our canoes being washed away, paddles gone, and tarp down. I was too exhausted to get out of tent. My fears were for naught as in the morning the site was calm and everything was in its rightful place. We started our day with another great breakfast by Chef John. We appreciate John’s menu planning, food acquisition, and certainly his meals are fit for royalty. Similar to our prior two days, we have been abused by mosquitos, black flies and whatever flying bugs we meet on our trip. I am not a DEET person and had been wearing a long sleeve jersey as well as a full body netting. One section we paddled before the locks, turned into a serious humming sound – and by that I mean bug sounds at a high and steady pitch. It was like we were immersed in a swarm of vibrating insects. What a surreal experience. Today would be the self-operated Uppers Lock from Middle Sarnanc Lake to Lower Sarnanc. Enjoy our first lock transition as we thoroughly appreciated the experience of going from a higher lake to a lower lake – bypassing a severe set of rapids. Sharing how we eat our pudding without a spoon when on our camping trips. Walked to high ledge on the island to view the beautiful sunset. 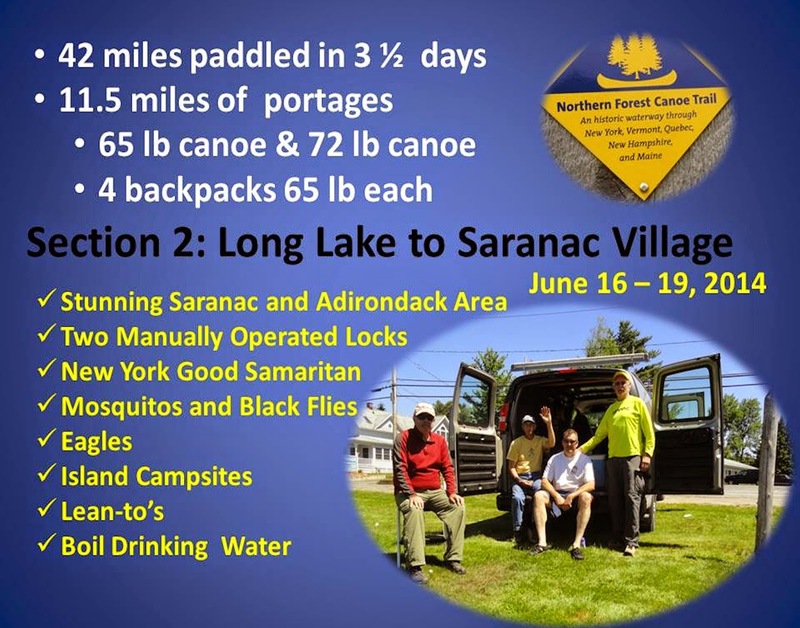 Day 4 – Our last day on Section 2 of the NFCT in the Adirondacks and Saranac. We paddled from our Partridge Island campsite through a second hand-operated lock to Oseetah Lake and then a take-out at the Village of Saranac on the north end of Flower Lake. We estimated Partridge Island to be about 8 miles or 3 hours of paddling from our take-out at the north end of Flower Lake. Yesterday, when we passed through the Upper locks, I was in the canoe being lowered. Today was Tim’s turn to understanding this transitory and unique Lower Lock feeling of our canoes and gear being transported via water from Lower Saranac Lake to Oseetah Lake. No lock operator was present at the lock and Dundee operated the manual controls while John and Tim paddled within the locks – and I documented their transition with videos. The whole passage would take about 30 minutes – mostly waiting for the lock to fill – and then empty, and gently hand us and our gear to the lower Oseetah lake. The paddling was easy and we soaked in the wilderness and beauty of the Adirondacks. We saw deer, huge rock formations, and shared highlights of our Saranac paddle. We all agreed, the portaging of our 65 lb and 72 lb canoes was the toughest part of the trip. On our next trip requiring extensive portages, we definitely would rent 40 lb canoes. After we did our final take-out at the Village, we went the NFCT Kiosk and signed the NFCT log book. Never say, "I wish I had paddled the Northern Forest Canoe Trail Section 2 in the Adirondack and Saranac wilderness." How long does it take to boil drinking water? Enjoyed your adventure in the Adirondocks! Those are really brilliant materials you've got there. Those can be totally the kind you can further exploit and reach into newer places with, such as newer markets, whether in animation or ad decor. It's all up to you to decide, really. You can totally seize those designs and expound on them creatively for better franchise opportunities. Good luck!